I didn’t need a calendar to tell me spring had arrived in North Carolina… All I had to do was look out at my yard and the yards of so many others to see them blanketed in pink, purple, white, and yellow flowers! I love this time of year before people pull out their lawnmowers, while they are still letting their yards turn into little wild places! And even the smallest wild place can be a place to find some wild food. Many of these flowers, including our featured plant today – violets – can seem so common that we take them for granted and ignore that they are just as beautiful as many cultivated flowers. Many of them are also quite edible and useful! This idea of something so prolific and common that we forget what a treasure it really is reminded us of our 100 Miles in 100 Days campaign. 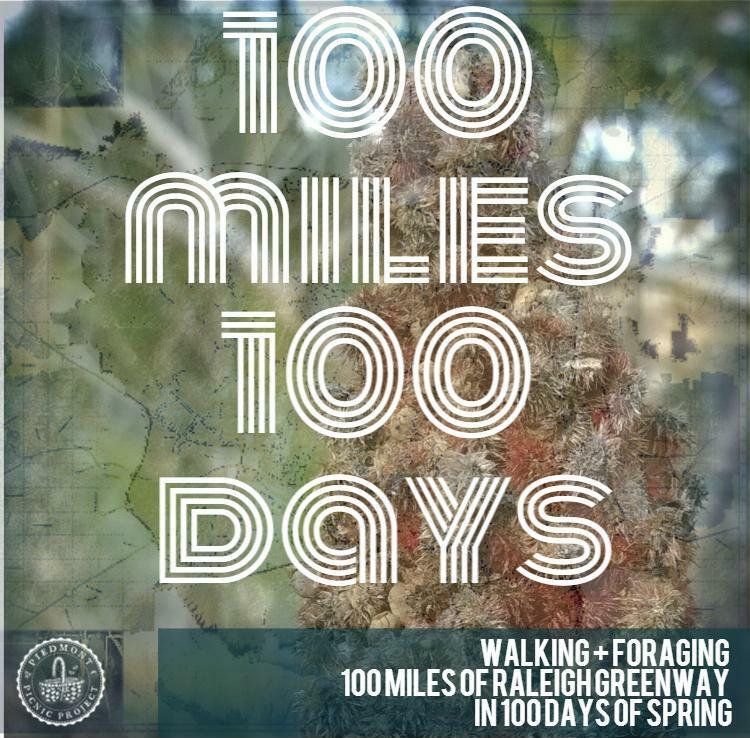 To us, the 100 miles of Raleigh greenways are something we have often ignored and taken for granted, but as we explore them more and more of late, we see their value as wild places full of wild edibles and full of a rich natural and cultural history. Where does Raleigh greenway history begin? Speaking of wild places, they don’t all have to be remote locations, left undisturbed for generations to create a perfect, mystical balance of how nature should be. Your lawn, or the vacant lot down the road–or the edges of Raleigh’s greenway trails–all have things growing in them, right? But what a bummer it would be if there weren’t. If everything were paved over. Or plucked bare. Thinking of the Dust Bowl in the Great Depression? Or the Lorax? Pretty bleak. When Raleigh was growing itself rapidly away from downtown in the 1960s and 1970s, voices began speaking out with concerns over what all the new construction and developments were doing to existing wild and natural spaces. Where were all the trees going? Or the people who loved them? And what about all the damn flooding? The short version of a longer story is that City Council turned a report from a summer intern titled, “Raleigh: The Park with a City in It” into a reality. The two main creeks, Walnut and Crabtree, would be protected to help manage the area’s floodplain, the surrounding wetlands would be a habitat for plants and animals, and the pathways would “give alternative to the automobile for short commuter trips” around the city. Ever since Central Park was created in NYC in the 1850s, there have been strong advocates for natural spaces within cities. However, the extent to which the Capital City Greenway is integrated into Raleigh’s business, residential, and other development was so unprecedented that it was considered the first citywide greenway system in the United States when it was begun in 1974. Each section of the greenway has been added in the years since then, slowly working toward making them fully interconnected. As land is turned over to be cleared, or paved, it creates opportunities for new wild things to grow. Chances are, if you’re in Raleigh, you’re not much more than a few minutes away from a greenway trail at any moment. Which also means, you’re not much more than a few minutes away from discovering some of Raleigh’s coolest natural spots. One plant that is so common on the greenways (and probably in your lawn) this time of year is the common blue violet. Sprinkle a handful of these blooms on any plate, and you will take it straight into gourmet territory. Description and Habitat. 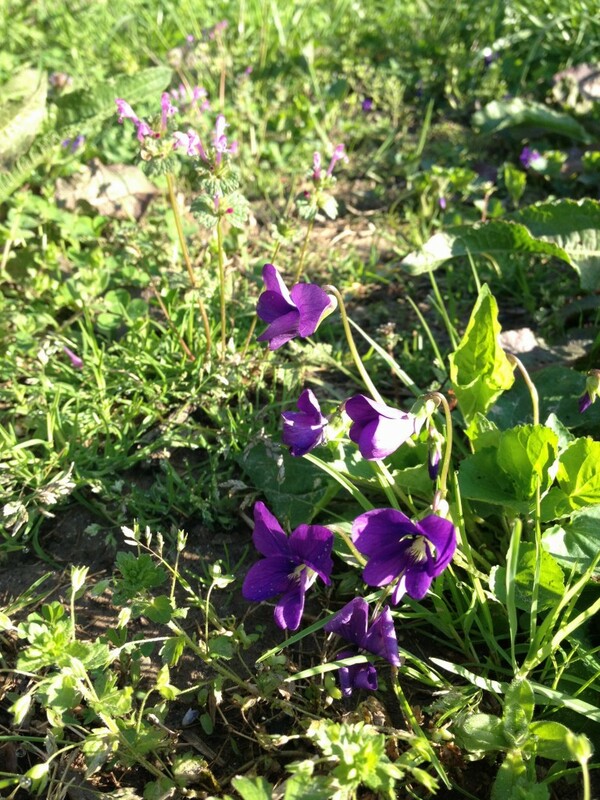 Violets like to grow in areas that are fairly moist, yet also offer some sun, which makes them bloom more prolifically. Look for heart-shaped, somewhat glossy leaves about four inches tall and five-petaled purple flowers about one inch across. Flowers have yellowish-white middles that are slightly furry. 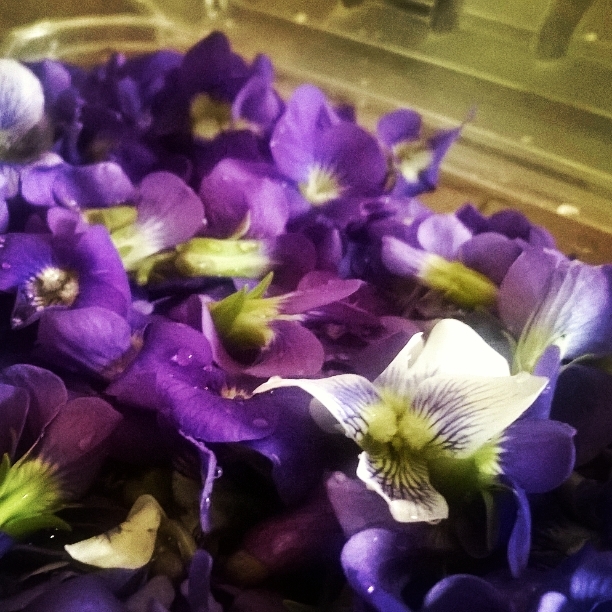 Some violets are white blossomed with faint purple veins in the petals and are just as edible and quite striking! Harvest. Blossoms are present in early spring (late March to mid April), and are best harvested in the morning. Leaves stick around most of the year. They are best harvested when still very young and rolled up like a scroll. Flavor and Use. Common violet flowers (unlike their more fragrant English violet cousins) have a very faint scent – almost undetectable. Their flavor is green tasting much like a salad green. Generally, their use is more for their striking purple color which lends itself to garnish dishes or to be infused in syrups and liqueurs. The leaves can be eaten raw or cooked – but when cooked can have somewhat mucilaginous qualities. 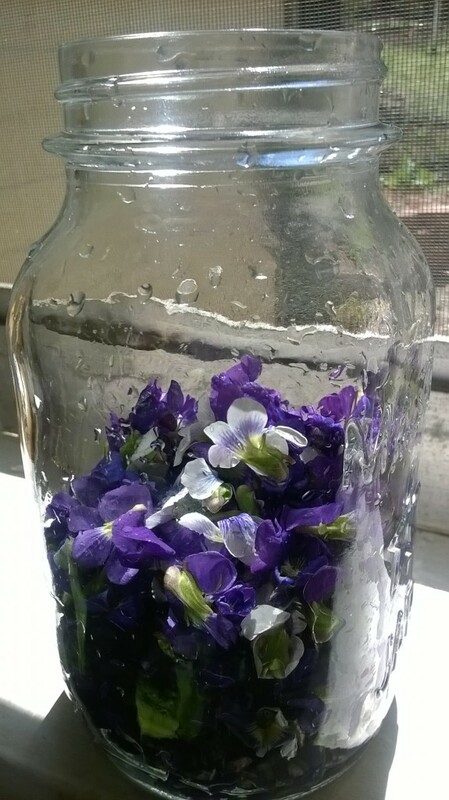 Place violets in a heat safe container such as the mason jar below. Pour boiling water over the flowers – just enough to cover them. 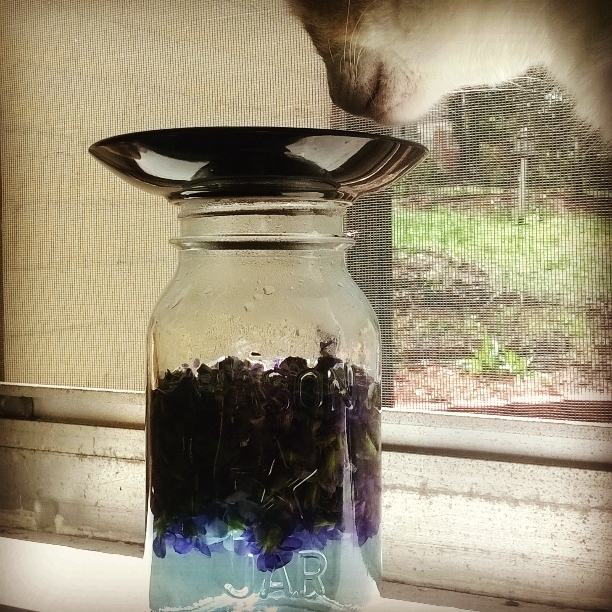 Place a lid/plate over the steeping violets and allow to sit for up to 24 hours for maximum extraction of that beautiful purple color (cat optional). Drain violets, squeezing as much liquid out of the flowers as possible. Gorgeous, isn’t it? Measure your liquid. At this point, you have two color options: pinkish-purple or bluish-black. 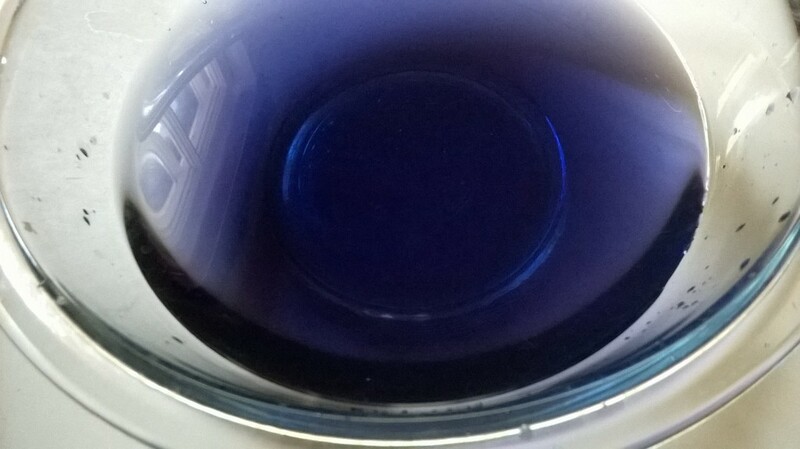 For bluish-black, warm your liquid with an equal amount of sugar (i.e., if you have 1 cup liquid, you’ll want 1 cup sugar) over low heat until sugar is fully dissolved. Do not boil. Pour into clean jar. The color will lose some vibrancy but stay more violet. Alternatively, add a few drops of lemon juice before sealing, and it will regain vibrancy but be a more pink-purple color rather than blue-violet. 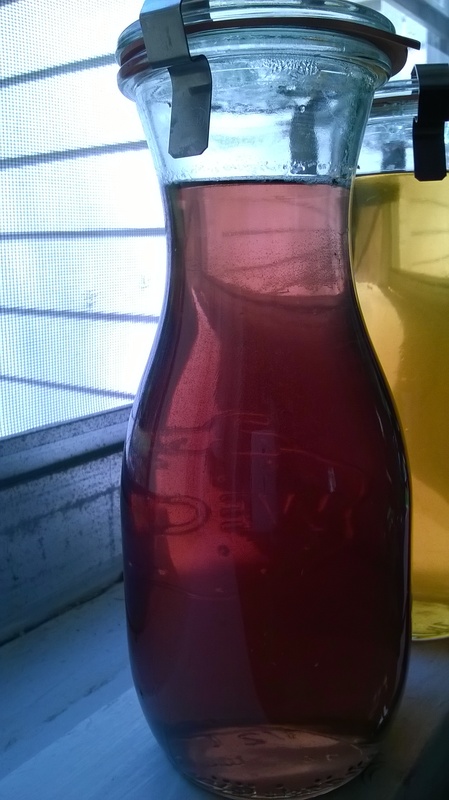 This pinkish-purple shade is in the photo below (the other bottle in the background is a ground ivy syrup made in a similar way). What to do with this gorgeous purple syrup with an oh-so-delicate spring green taste? Why not a cocktail? We call it shrinking not for it’s flavor, but because it seems to disappear so quickly! 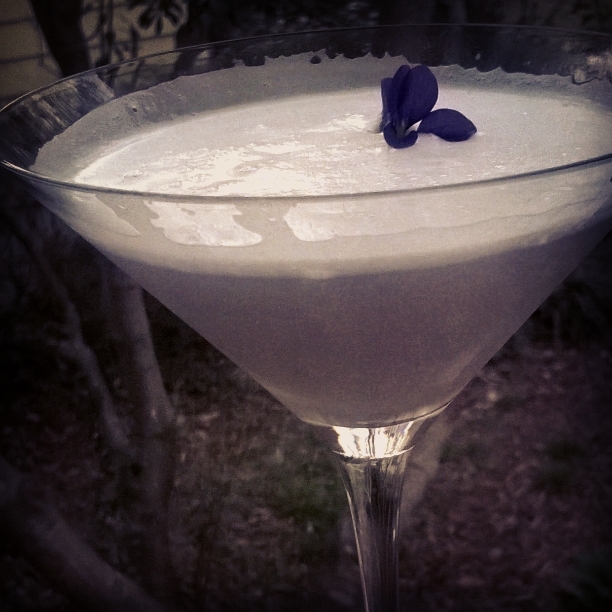 Garnish with a violet, of course! I have never seen violets in Raleigh. Been looking in my woodland area for years. Too shady? Also on Greenway near Buffalo Road.